Register now for Instant Online Access to all local DFW area listings! Rockwall County is second of 254 counties in Texas in median housing value. Most of Rockwall's existing homes are in the $ 125,000 to $ 500,000 range with a significant number in the upper end of this range, including selection of million and multimillion dollar water front luxury estates. For a county of only 144 square miles, a variety of neighborhood types is predominant in Rockwall. Whether you enjoy Lake Front or lake view living, country club living, or you need to roam on rolling acreage, Rockwall offers diversity for all lifestyles. 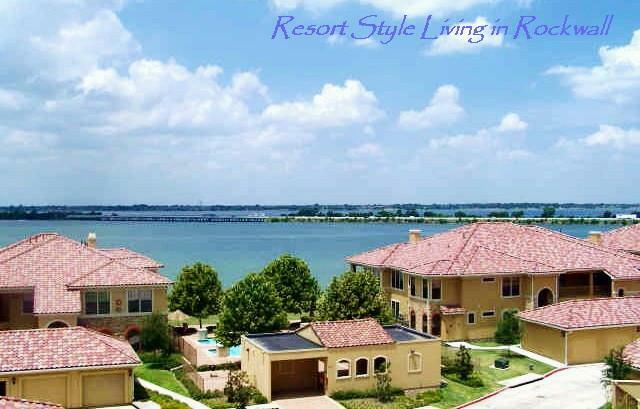 And Lake Ray Hubbard's recreational activities are the bonus that singles, families, professionals and retirees can enjoy no matter which neighborhood they choose to call home. Rockwall is only 20 minutes from downtown Dallas. Highway 66 provides primary east-west access through Rockwall to Garland and Northeast Dallas. Recently widened I-30 provides easy access from Rockwall to downtown Dallas, which is just 22 miles away. Rockwall city streets have been planned to stay ahead of rapid growth and provide for continuous movement throughout the city. Union Pacific Rail service provides rail transportation to Rockwall's growing industry. Rockwall is 30 minutes from Love Field and 45 minutes from DFW airport. Rockwall also has its own general aviation airport with hangar facilities. Rockwall residents enjoy 111 miles of shoreline and 22,745 acres of Lake Ray Hubbard. The lake offers all water sports, including fishing, water skiing, world-class sailing, power yachting and more. Chandlers Landing Yacht Club and Marina are home to many area boats. Most weekends throughout the year can see colorful sails of boats on the lake. Rockwall has two renowned golf clubs: The Shores Country Club and Golf Course, and Buffalo Creek Golf Club, which has been consistently rated by the Dallas Morning News as one of the top two public fee golf courses in the state.